Looking South towards the summit of Mt. Haystack. Within 4 weeks of Project 46 I felt I was in need of a solid outing with at least 8,000 feet of elevation gain. (Elevation change is more important than distance). So, at 8:30 am, which was a late start, I signed out at the trail register on the property of the Adirondack Mountain Reserve. I began the 3.5 mile walk up what is known as the Lake Road, which leads to Lower Ausable Lake, some 900 vertical feet above. This private road is gated and only members of the club are allowed to drive on it but hikers are permitted to walk it in order to gain access to the trails that lead to the Peaks. My plan was to begin the day with Sawteeth Mountain (4100 feet elevation) which would give me 3000 feet of gain to get started. It took me 3 hours from the gate to the summit and I kept a move on down the west side of the mountain. I had done the same route only 2 days earlier and my tracks were barely discernible under the fresh powdery snow that had fallen and blown in. I was wearing microspikes but carried both MSR Evo Ascent snowshoes and 10 point crampons on the outside of my pack. Two days ago, I had packed the trail with snowshoes so I decided to remain in the spikes and this proved to be a good move as my descent rate was a lot quicker. My wrist altimeter indicated -70 feet/minute, which is pretty fast. After skidding and running down 1200 vertical feet the trail became less steep I settled into a fast walk until I arrived at my 2nd checkpoint, Shanty Brook at 2000 feet elevation. At the beginning of the descent I stopped and dug my GPS out of my pack and began recording a tracklog. At lower elevations the trail is mostly in an open hardwood forest and if it is hidden by fresh snow losing it is easy. I would be returning in darkness and if it snowed enough throughout the day to obliterate my tracks it would be easy to get lost. The tracklog would eliminate that potential problem. I reached Shanty Brook at 12:30, which meant the sun was now going down, instead of up. It would set at 4:50. I had several possible route options but my preference was to climb Mount Haystack (elev. 4960) via Bartlett ridge and do a traverse of Haystack’s half-mile long summit ridge. I would then descend towards Shanty Brook via a different trail. As I hiked I began making mental calculations using the data from my wrist altimeter, which indicated my vertical ascent rate would remain in the 20-25 feet per minute range. I would reach the summit of Mount Haystack at 4800 feet at 3:30. If, at any time I changed my mind I could always just turn around and follow my tracks back out. Why would I turn around? 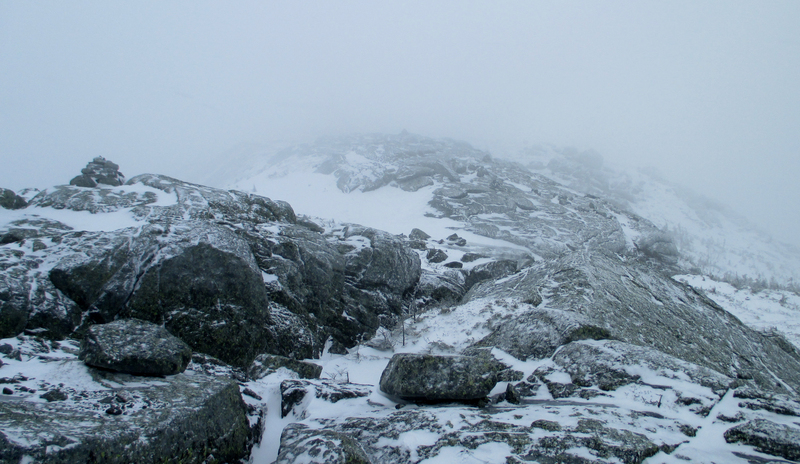 The summit weather forecast for nearby Mount Marcy (5300 feet) indicated 50-60 mph winds (80-90 kph) with a wind chill of -30 F. Plus, it was snowing with a low cloud cover. 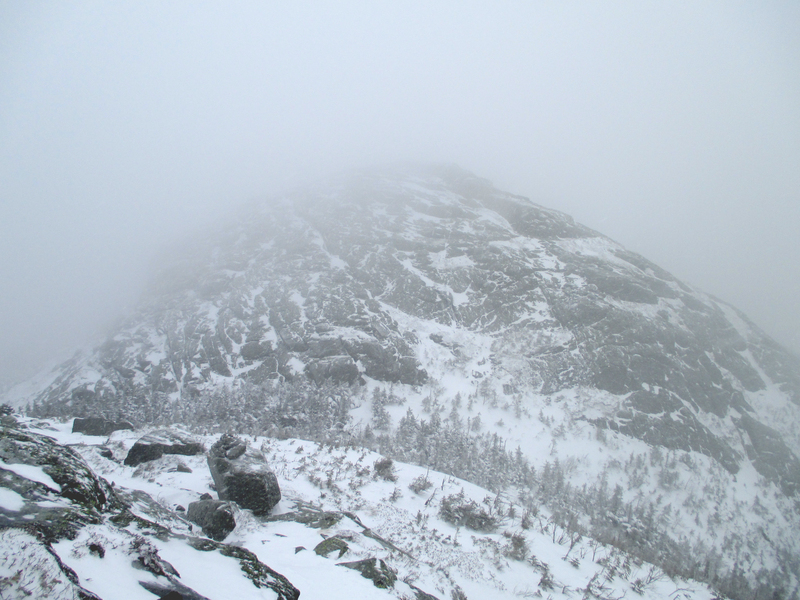 The summit of Haystack might be in a complete whiteout with howling winds and driving snow. In spite of having a pre-recorded tracklog in my GPS and memorizing the compass bearing for the traverse (pretty easy: due north) I didn’t consider it prudent to expose myself, all alone and so far away, to those conditions. One mile past Shanty Brook and 1000 feet above it the trail forked. Bartlett Ridge was to the left, a steep 1000 feet above and the Snowbird Trail led to the right up to the opposite shoulder of Haystack. I veered left and before long the snow depth increased greatly so I stopped and put my snowshoes on. By 2:20 I was at the final trail junction with a sign indicating that Mt. Haystack was .75 miles away. I ate some food and drank a bit of water. My hands were mildly cold and I felt a bit chilly. My wool mitts and synthetic base layer shirt were damp from perspiration but my outer mitts, shell pants and jacket were Gore-tex, which is breathable (to a point) so I wasn’t soaked. I decided not to change into dry mitts and base layer because the 900 foot ascent would warm me up and create more moisture anyway. After 20 minutes of steady but steep climbing I reached tree line. It was blowing but not too bad and I could see a good ways up the mountain. It looked very forbidding: it was all bare rock with cliffs and steps, covered in green lichen and great plaques of very hard ice. Clouds whipped across it. The route was indicated with small cairns and yellow paint blazes and was easy to follow. The wind grew stronger but was at my back until 100 feet below the summit where the trail turned to the north and the wind hit me from the left side. I kept moving and put my left hand up against the side on my face for protection. What it felt like on the summit. Just below the summit there was a leeward platform and there was no wind at all in that tiny space. I switched into dry mitts, a thicker balaclava, goggles and a face mask and traversed to the north end of the peak, descending about 300 feet as I went. 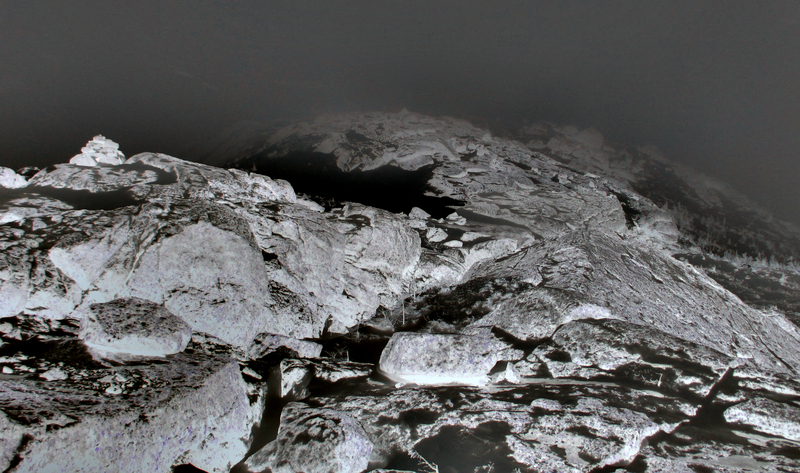 I felt very, very small and vulnerable on that treeless lunar landscape that went in and out of the clouds. Snow was being whipped about and I trod very carefully on a mixture of rock, ice and snow. Looking north to Little Haystack, my next objective. Back at treeline I picked up the Range Trail. I had ascended 600 feet on this same trail 2 days ago and had had to break through 8 inches of new snow. My tracks were gone, buried under a new foot of snow. I descended the 600 feet in 6 minutes, using my snowshoes like little skis and turned hard right at the Snowbird Trail. Now I was ready to drop off the Great Range. The Range is 12 miles in length and its ridge line traverses 7 or 8 peaks (Haystack is an out and back trip from the Range Trail). I sped down to the Snowbird-Bartlett ridge trail junction (elev. 2700) and picked up my inbound tracks which were now half-buried under new snow. My goal was to reach and cross Shanty Brook before needing to put on my headlamp and this I managed to do. I stopped to eat and drink and put one headlamp on and my backup headlamp in my pocket and off I went. It was 5:20 and dark now. It was snowing lightly and my breath swirled with the flakes and obscured my field of vision but in a nice benign way. I was at a new crux. A physical crux, not a technical one. With 6000 feet of ascent (and descent) already in me I now faced 2100 feet of climbing. The final 1200 of those would be very steep and unrelenting. Then I had another 3000 feet of descent and roughly 2 ½ hours of hiking from the summit of Sawteeth to my car. I re-set my altimeter to zero to provide myself with feedback and to (hypothetically) enable my “knowing” brain to keep my muscles properly fuelled and powered for the job at hand. I had been mentally preparing for this re-climb of Sawteeth all day. In fact, I spent most of the day mentally preparing for nearly every upcoming leg of the journey and was constantly weighing data and creating scenarios and making mental choices depending on what might be coming. Now, in total darkness with my breath swirling and falling snow reflecting in my headlamp beam I followed my half-buried and forlorn-looking footsteps back up. After 1000 feet of ascent the trail began the 1200 foot steep ascent. My MSR snowshoes’ steel crampons bit beautifully, my pace felt perfect and I felt great. I checked the altimeter 3 or 4 times so I would always know just what was in store for me and I topped out on Sawteeth 1:45 from the Shanty Brook crossing. I didn’t break stride in the snowy night and I followed a fresh set of Pine Martin tracks in otherwise unbroken snow was down on the road, 2000 feet below in an hour including time to stop and switch from snowshoes to microspikes part way down the Weld Trail. I signed out at 9:15. I had been hiking for more than 12 hours and hadn’t seen a soul all day. I was thinking all the while that I was now going to drive home to Montreal. But the instant I stepped in the door at my sponsors’ (Randomscoots Cabins) house in the nearby town of Keene I knew I was going no further. After a scalding hot shower and a cup of hot water laced with honey followed by a bowl of chicken pasta I nodded off for a long winter’s nap.